Beautiful ranch-style home in idyllic setting on tranquil Lake Sinclair! From the moment you enter, you have stunning lake views from the spacious great room, beautifully appointed with 2 sets of double French doors, decorative fireplace, recessed lighting, dining area & crown molding in a perfect open plan setting. The kitchen features stainless steel cooktop hood, island with breakfast bar, granite counter tops, clean, white cabinets, 2 pantries and picture window with sweeping views of Lake Sinclair. The den is currently a media room but it could easily be an office/study. The master suite features walk-in closet, French doors for access to side/back yard, a butterfly garden view and a spacious en suite bathroom with oversized shower, also with a lake view and large vanity for plenty of storage. Both guest bedrooms are spacious and well lighted and a guest bathroom with shower/tub combo. The backyard has a screened, covered patio (27x10) and is partially shaded from afternoon sun by a stately oak. With a western exposure, overlooking the lake, the patio is the perfect place for enjoying magnificent sunsets. Plenty of parking with an oversized, paver driveway and one car garage with washer/dryer hookups. NEW ROOF & NEW WINDOWS in 2017. 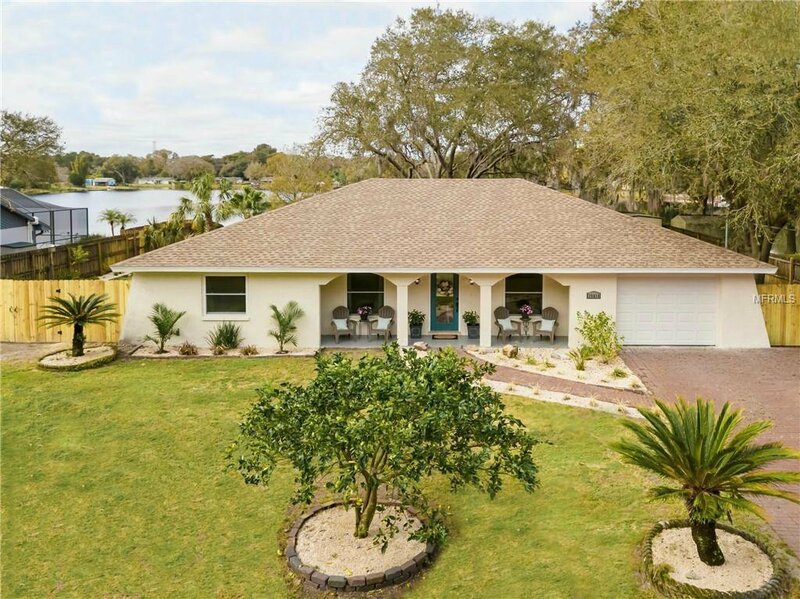 The lot is over a third of an acre (100x150), NOT in a mandatory flood insurance zone and just steps away from the beautiful Violet Cury Nature Preserve, a true Lutz gem with trails and lake. Come enjoy fine country living just 15 minutes from Downtown Tampa! Listing courtesy of KELLER WILLIAMS SOUTH TAMPA. Selling Office: ROOST REALTY INC..